Breakdown Of What Has Changed In v1.1 Firmware The latest firmware v1.1 for the 10in1 multi gauge we sell has arrived and stocks programed with the latest firm..
Wideband AFR Lean Out Warning Added While there has been only one feature added in this latest firmware, it’s a big one. This latest firmware which all stocks .. Version 2 has landed!!! Over the last year there has been a fair few changes to the multi gauges, addition of the wideband lean out warning, making the oil and.. Here we have the most popular screen / gauge to pair with the multi gauge base unit & sensor package. This is a compact digital OLED multi gauge capable of displaying up to 6 different sensors on the one screen at once, and a total of 14 readouts overall can be selected and displayed. Note this is just the screen itself, to use it you need to also buy the multi gauge base unit & sensor package, together both these products make up a complete all in one digital gauge system for your performance car. While some might have a bunch of room in their cars to setup an array of gauges, there are others out there where space is limited or those who just don’t want up to 8 different gauges in their cars to monitor engine vitals. This is where these little 14in1 digital multi gauges really shine, this little but powerful screen enables the user to keep a close eye on almost every single important system of your performance vehicle in one place. It is able to display Oil Temp, Water Temp, Oil Pressure, Fuel Pressure, EGT, IAT, Boost, Differential Pressure, RPM, Speed, Dual Volts and even has a wideband readout which can display AFR or Lambda. All of this in a compact and completely configurable little display. Whether you are just looking for a complete all in one display to monitor vitals of your performance street car, or you are a weekend warrior and take to the track, this little digital multi gauge has you and your engine covered. These 14in1 gauges are designed to only be connected to the Multi Gauge Base Control Unit & Sensor Package v2 that we also sell, which come with sensors to install and the control unit which these gauges then connect to. These are not an OBD system and are designed to be standalone gauge system. Some people are looking for ODB gauges, but there is just as many if not more looking for standalone setups such as these. OBD gauges can only read data and sensors that are already connected to the vehicle and information supplied by the factory ECU. With this standalone setup, using one or more of these displays in conjunction with the Multi Gauge Base Control Unit & Sensor Package v2, you install all the sensors and they are completely independent of the factory or aftermarket ECU’s which itself has a lot of advantages. 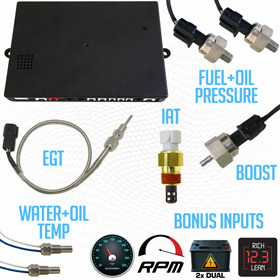 Make sure to pop over to our Multi Gauge Base Control Unit & Sensor Package v2 page by clicking on the image below to learn more about which sensors come with the base pack and what extra inputs can also be connected for these gauges to give you a readout from. Any questions about either of these products please feel free to contact us. These multi gauges are using an OLED screen rather than LCD, this has a few advantages, one of them being they are very bright and clear to read, they also offer a much better off angle viewing than LCD, which gives you more options for placement of the screen. One of the most important aspects of a gauge is being able to read it clearly in all conditions, this is where the OLED display shines over LCD, excuse the pun. You don’t have to work around the poor viewing angles of LCD, or their weaker self-illumination, these OLED screens are bright, clear to read and can be easily read even if you have the gauge on an off angle from your line of sight. Of course being that they are a very bright gauge, they also have a 3-state automatic brightness adjustment, there is a built in light sensor on the gauge so it can reduce or increase the brightness for you. There is also a 5-stage manual brightness adjustment if you wish to go that way. This digital multi gauge has four different screen display layouts you can switch between, two of these are completely customizable, as in which sensors you want displayed and where on the screen, the size of the cell space on the screen to be used for the sensor. You can see from the cell breakdown charts below the different options for sizing of the cells, which sensor readouts are supported by each cell size and placements options. Another feature of the multi gauge display is the ability to configure KPH, MPH, PSI, KPA, Celsius, and Fahrenheit independently. So it’s possible to setup the system so it uses KPH, Celsius & PSI for pressure readings. A lot of us Australian’s like our pressure readings in PSI and not KPA, so this can be done without a problem, no need to try and learn KPA if you are used to PSI. When the cell is set to size A, you can switch between the below readouts on that cell. When the cell is set to size B, you can switch between the below readouts on that cell. When the cell is set to size C, you can switch between the below readouts on that cell. As the base system supports serial daisy chain, it’s possible to run more than one of these screens if you wish. The main cable coming from the sensor base unit connects to the first gauge, and then each extra screen comes with a daisy chain cable as well, so if you buy two screens, you have the cable to connect the two screens together. This allows for many possibility’s, an example is these screens aren’t huge, and you can only have up to 6 sensors displaying on the one screen. But what you can also do is change the screen to display only 4 sensors, but two will appear much larger on the screen, so with two of these multi gauges running at once, you can get the 8 sensor readouts, but with a much larger display space for four of the sensors on the screen. And just like we talk about on the base unit & sensor package page, it’s possible to daisy chain in a combination of this digital multi gauge, standard 60mm stepper gauges, and even big 95mm tachos. Some people will use the multi gauge, but want a separate 60mm boost & AFR gauge, and you can do it, all running from the one base unit. You can pretty much create your own multi gauge system the way you like. For those wanting a complete solution and don’t currently have a wideband setup in their car, we are proud resellers of 14point7 wideband products. We stock and sell their Spartan 2 wideband controllers which will connect directly into the base unit and then the wideband signal is sent to this gauge so you can also use this little device as your wideband display for air fuel ratios as well. If you already have another wideband controller and wish to use it with this multi gauge, the only requirement is it can output an analog 0-5v signal with an AFR range of 10-20. The Innovate LC-1, LC-2 & MTX-L for example you can re-program the analog output to match the input requirements of this gauge to display air fuel ratios. Even if you already have a wideband with its own gauge display, there is good reason to want to run its output into the multi gauge, and that is to take advantage of the wideband AFR lean out warning these gauges are equipped with. If you already own a wideband and are unsure if its output can be programmed or not so it can be used in conjunction with this multi gauge, feel free to get in touch and we can assist. One of the latest features added to these gauges is a wideband air fuel ratio lean out warning, for those customers that plan on using a wideband connected to these gauges, this is really a massive deal. The purpose of the wideband lean out warning is to let you know if your car starts to run air fuel ratios leaner than what is normal or the car was tuned for, this can be configured to meet requirements of both boosted and NA cars. Wideband gauges alone with this feature can set you back over $500AUD, when you either buy the Spartan 2 wideband we sell to use with these gauges, or use your existing wideband if it supports an analog out 0-5v 10-20 AFR, you can make use of this exciting and powerful new warning feature. Let’s face it, while we all periodically stare at our various gauges from time to time when driving, some more than others, if your car suddenly goes from running its tuned 11.5 AFR to 14.5 AFR when running boost, it would not take long before some pretty catastrophic detonation could occur. This is not something you really want to leave up to human detection, the time frame where engine damage could occur from a situation like this is far too short. So having a wideband lean out warning such as this, could very well help you catch a situation within seconds where something went wrong with your fuel system and you suddenly started to run extremely dangerous air fuel ratios for your motor. We have written a detailed blog post about this latest wideband air fuel ratio warning, how it works and explaining the settings used to set it up correctly, click here to take you to that page. Another feature that was added in this latest revision is now the ability to select between AFR or Lambda readouts for the Wideband input. The version before had just AFR readings of 10-20 which is the range used for petrol, now while you can still use this on fuels like e85, ethanol etc, it’s not the working range people are used to when dealing with fuels other than pump petrol. It’s now possible to switch the gauge to displaying 0.68 to 1.36 Lambda readings which is the wideband controller’s native reading before it’s converted to AFR on gauges. This now means if you are running e85, methanol, and ethanol fuels that you can use Lambda to gauge your fuel mixture. Some tuners and customers actually prefer using Lambda even for pump petrol, so this should appeal to a wide range of customers having Lambda as a display option for the wideband readout. The Spartan 2 widebands we sell have a Lambda range of 0.68 to 1.36 and is wide enough of a range for most alternative fuels except for Diesel. Just like firmware v1.2 where there was a wideband lean out warning added, this function will also work with Lambda, so you can setup the highest Lambda reading you would like before a warning is triggered while under a certain level of boost or WOT on an NA setup. With the edition of an IAT sensor to the v2 control unit & sensor package, this has now given the ability for these gauges to display and monitor air intake temperatures. This is an important thing to keep an eye on with turbo & supercharged vehicles so you can monitor their air intake temps after their intercooler. Almost all aftermarket ECU’s use these sensors as they can play a pretty decent role in how the tune is setup, if your temps get very high in most cases the ECU will have a curve that pulls timing if they get too hot to avoid detonation from excessive intake temperatures. Now not everyone has an aftermarket ECU on their cars, but they are running turbo or supercharged and having a readout that can show you your air intake temps can be a very handy thing. You can assess if your intercooler is up to its job, or if out on the track really pushing it you can see when it might be a good time to back off. Same goes for the 4x4 guys, being able to see intake temps is a very handy thing to have. Now even if you do have an aftermarket ECU, while the ECU will be taking the readings from its own sensor into account, in most cases unless you have some kind of dash display setup reading from the ECU, you won’t get to see what IAT are doing, installing the second sensor from this kit will give you a visual display of temps that you can monitor as well as the ECU doing its thing. Just like all the other sensors and readouts on these gauges, you can setup a warning system that if your intake temps start getting too hot the gauge will alert you. We feel the addition of this sensor and readout was a big step towards making these kits such a complete engine monitoring system. Another edition to the v2 control unit was a dedicated second volts input, this now allows these gauges to give two independent volts readouts. This was done mainly for the 4x4 crowd who have really taken to these multi gauges, most 4x4 people will have auxiliary batteries in their vehicles where monitoring their voltage is important to them, so the second volts was added. The unit senses the first volts from the power being supplied to the control box, and the secondary volts has its own dedicated input on the control box itself. Both primary and secondary volts are able to have warnings set independently as well on the multi gauge display. Now for our performance or track car customers who might think this feature won’t be of use to them, well we think it actually can and in a pretty cool way. Voltage drop to fuel pumps can’t be an issue in some applications, any drop in voltage to your fuel pump can lead to drops in flow and possible changes to fuel pressure. So in a performance or track car setup, you would run a line back from the power wire powering the fuel pump and you can closely monitor your fuel pumps supply voltage, and also setup a warning that will help you catch if there is any voltage drop happening at the pump. This gauge also has a pretty handy on-board logging and peak values display. While the logging isn’t like that of an aftermarket ECU where you can download it and analyse on a PC, it’s still a pretty handy little system. You are able to record up to 3min of driving time, and all the values on each sensor in real-time, so that you can play back the 5min log on the gauge itself to analyse. We also find this system helpful when it comes to setting up certain functions on the gauge, for example the oil pressure warning. To properly setup the oil pressure warning, you need to see what your oil pressure is at a certain rpm normally to input a value for the warning that the gauge can use, this logging allows you to record and then replay a run so you can work out your warning values for things like oil pressure, fuel pressure, differential pressure. Each of these warning values will vary from motor to motor, so being able to log and playback can come in very handy to help decide on the appropriate values to use for the warnings. The peak display is also another cool little feature, when in peak mode, you can have 5 readouts on the screen at once, and the unit will update each readout with the highest value it has recorded for that given sensor or input. All sensors and inputs are supported in this mode, so you can get peaks on your boost, oil & water temp, oil & fuel pressure, EGT, volts, RPM & speed. This is not limited to 5min like the logging function, you can happily leave the gauge in peak mode if you so wish and it will continue to update the peak values. Again this can also be a good way to determine appropriate values for some of your warning alarms, for things such as boost, oil & water temp, EGT, you can give the car a good hard drive and then establish the most practical values for those warnings. Note that the warning alarm system is also still active in this mode, so if you do go above an already set warning value, you will still be alerted by the gauge. Another feature of the gauge is that you can calibrate the boost, oil pressure and fuel pressure sensors. As sensors age, they can start to read slightly off, for example the boost sensor at atmospheric pressure the sensor is now showing 0.1psi or 0.2psi on the gauge when it should be reading 0.0psi. Some sensors when they come from the factory can be just slightly out, again example 0.1psi. What you can do with this gauge is calibrate to offset these slight variations. So if your sensor is reading 0.1psi on the gauge when it should be 0.0psi, then you can add a -0.1psi to the calibration to bring it back to a 0.0psi display on the gauge. Another bonus of this system being digital is that this gauge has a built in error diagnosis. If any of your sensor cabling has shorted out for any reason, its display on the gauge will change to SHORT. Or if the sensor has become disconnected while driving, the screen will display OPEN on the sensors readout. This can be handy if a sensor stops working, you have a good idea why. Another feature of this little gauge is it’s built in programmable shift lights with 8 LED’s, it has multiple colours that can be selected for the indicator lights, red, blue, green, white, yellow, cyan, purple, multi-colour and the new edition of race which is a combination of green, yellow and red. For the race selection, the first three lights will be green, next three yellow and the remaining two lights will be red. The way the shift lights can be configured to illuminate throughout the rev range is fairly customisable. For example, you would first setup the rev limiter warning in the gauges warning setup, this dictates the end of the light sequence, so for this example let’s say its 7000rpm. Now the gauge then has four RPM step options for the LED’s which will dictate how wide the RPM scale of the lights are, these are 100rpm, 200rpm, 250rpm & 500rpm. So for example, if you select 100rpm and have your tacho warning set at 7000rpm, the shift lights will start to come on at 6200rpm and finish at 7000rpm. Or if you selected say 250 RPM, the lights would start illuminating at 5000rpm and finish at 7000rpm. This little system can be setup in a few ways and is a really decent little shift light system. You can also setup the tacho warning slightly below the actual rev limiter on the motor itself, what this will then do is when you exceed the RPM set in the warning setup, the gauge will also put out a loud warning beep on top of the shift lights finishing their range, so you will have a visual and audible indication you missed your shift point. One of the additional features that can be used with these gauges when you have connected both the fuel pressure and boost sensor is what’s called “differential fuel pressure”. This readout can be very handy in making sure your fuel system is up to the job. It’s not necessarily something you will use all the time, but it’s great to have when your car is being dyno tuned, and in future to make sure there are no fuel supply issues. It’s more used as a diagnosing tool, sure we have AFR readings, but if they start to go out and you don’t know why, having differential fuel pressure readout can help you determine if the problem is coming from your fuel system. We will write an article on our blog that goes into detail about what differential fuel pressure readings are and how they can help. One of the most practical and in our opinion most important features on any gauge system is the ability to setup warning alarms for the sensors. These multi gauges support warning alarms to be set for oil temp, water temp, oil pressure, fuel pressure, boost, EGT, air fuel ratios, differential pressure, RPM and even speed. When out on the track, you don’t want to be looking at the gauge every 10 seconds to make sure you aren’t about to cook the oil, dropping oil pressure or anything else nasty that could cause engine damage. With the huge array of warnings that can be setup on these gauges, you can focus on driving and enjoying the car while knowing this little gauge is keeping an eye on everything for you and if there is a problem, it will let you know. Example is you can have oil temp set to trigger the units alarm if it reaches over 110c, or another is to be able to have oil pressure trigger an alarm if oil pressure drops below say 50psi while the motor is over 5000rpm. The oil pressure warning system is pretty cool and was updated in firmware v1.1 of these gauges, if you would like to see an example explanation of how the oil pressure warning works differently to that of other oil pressure warnings, have a read of the blog post about the firmware v1.1 update which is linked to from the related articles tab at the top of this page. This article also explains the fuel pressure warning setup, which like the oil pressure warning is done differently to how other gauges would handle this type of warning. If a warning is triggered apart from the unit beeping, it will highlight the sensor which triggered the alarm on the screen. If the screen you have selected does not currently have the sensor which triggered the alarm displaying, the bottom left hand cell on the gauge is a multi-cell. So let’s say Oil Temp triggered a warning alarm, but the screen you have the gauge set to does not have Oil Temp as part of the screen configuration and you have boost in the bottom left of the screen, where the boost is will change to a highlighted Oil Temp along with the unit beeping so you know exactly which sensor has triggered the alarm. In addition to this we also sell an add-on cannon style warning light that can be used with these multi gauges. You simply connect it to the gauge and you can then set the gauge to use the cannon light as a warning light, when an alarm is triggered, along with the unit beeping, the cannon style light will also illuminate to attract your attention. You can configure which of the warnings actually use this light as well, so you can if you wish limit which warnings will trigger this light to critical warnings only.